TA Securities says it does not rule out the possibility of the Employees Provident Fund taking up a minority equity stake in the project at a later point in time. SIME Darby Bhd, the country's largest publicly-traded plantation company by revenue, is poised to sign by as early as this week a sales and purchase agreement (SPA) for the coveted Battersea Power Station in London. "(The) management is targeting to sign the SPA today. According to (the) management, the development plan has been acquired from the previous owner (Real Estate Opportunity plc), which has already been approved by the authority," TA Securities said in a report dated July 4th. "This would enable the joint-venture company to commence the development immediately instead of getting a new development approved, which in a typical development size could take few years," the report stated. TA added that it does not rule out the possibility of the Employees Provident Fund taking up a minority equity stake in the project at a later point in time. Last month, Sime Darby and its partner in the venture, SP Setia Bhd, said that they had emerged as the preferred bidders for Battersea. The duo had outbid rivals from parties such as Russian tycoon Roman Abramovich, whose Chelsea football club is located close to London's Battersea Power Station. The power station is a famed part of London's skyline and its cultural influence has led the British government to list it as a Grade II-status building, meaning "particularly important building of more than special interest". "The project will be on a build-and-sell concept. The first phase of development will be the residential unit. More than 50 per cent of the site will consist of residential unit, while the balance portion will be for commercial purposes," TA said in the report. 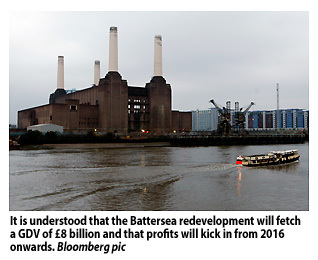 It is understood that the redevelopment of Battersea will fetch a gross development value of STG8 billion (RM39 billion) over 17 years and that profits from the project are expected to kick in from 2016 onwards. "(The) management declined to reveal any financial details but indicated that the return on invested capital of the project will be higher than the group's hurdle rate of 15 per cent. Profit before interest and tax margin is expected to be higher compared with the typical 20 per cent to 25 per cent that a property development project in the UK could fetch," the research firm said. Also in the report, TA said it has a "buy" call on Sime Darby, with a target price of RM11.38 a share. Sime Darby shares closed at RM9.93 a share, giving it a market capitalisation of RM58.53 billion, or more than two times the market capitalisation of Felda Global Ventures Holdings Bhd, which stood at RM20.06 billion yesterday. TA Enterprise Bhd plans to set up a Real Estate and Investment Trust (REIT) to unlock the value of its properties under management. "If we were to put all the major assets into a REIT, then we can unlock the value and raise money to repay bank loans, while funding projects in the pipeline," its Chief Executive Officer, Datin Tan Kuay Fong said. She was speaking to reporters after the company's annual general meeting here today. However, she declined to reveal further details, as to when the company plans to launch the REIT. "We will let you know when we ready. Currently, we are still exploring the opportunities," she said. Meanwhile, TA Enterprise Bhd subsidiary, TA Global Bhd, has received shareholders' approval to jointly develop a hotel and residential building in West Georgia Street in Vancouver (Canada) with a Canadian company, Birkbeck Trust on a 50-50 basis. The building has a projected Gross Development Value (GDV) of RM1.54 billion and is expected to generate a profit of RM423.46 million with both companies receiving an equal profit. On the domestic front, the company is expected to launch the Peninsular Puchong residential project in the fourth quarter of this year, or in the first quarter of 2013. The launch of the project will also depend on market demand as at present, the local property outlook is not so vibrant.